A modern twist on a traditional piggy bank, the Blessing Bank® teaches the biblical principle of giving to the church or to those in need. Your child puts money into the Blessing Bank® that he/she will later use solely for giving. 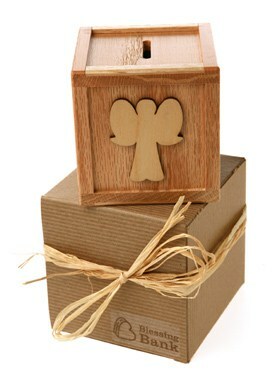 The Blessing Bank® is made out of birch with oak accents……simply beautiful. There is also the option of oak with birch accents if you prefer. It is a 3.5” inch cube and is made in the U.S. out of 100% reforested wood with recycled packaging. The details are very nice and I was impressed by how sturdy it is so it will easily stand up to rough little hands. It is very important to me (I am a social worker by degree) to teach my children about helping those who are in need so I love the concept behind the Blessing Bank®. What works for our family is that all of my children have their own piggy banks and one Blessing Bank®. Every time they find, earn or are given money they put it in their piggy bank and make an offering to the Blessing Bank®. I have decided to leave the amount that they decide upon up to their own discretion and I was very pleased with their generosity. When the Blessing Bank® is full we will talk about different ways that they can donate the money and I will let them make the final decision. The Little Blessing Bag is the perfect way for my little ones to carry their offering to church or to the donation site. What a perfect gift idea for a baptism, christening, communion etc. You can purchase the Blessing Bank® by visiting the website.